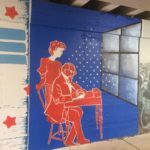 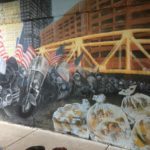 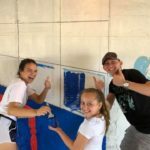 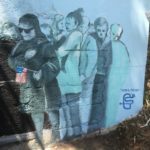 This week the amazing crew of outstanding interns, diligent local artists and drop in volunteers completed the first of two murals designed by Cyd Smillie honoring Veterans. 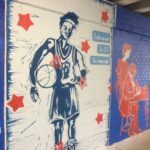 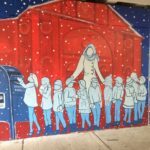 11th ward Alderman Patrick Thompson and his crackerjack staff organized two community paint days with over 150 volunteers and students from 3 area schools to prime and paint the walls for this DCASE YOPA project. 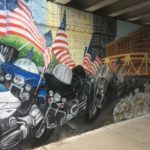 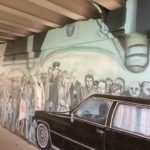 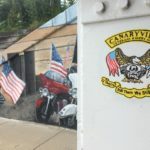 Weeks of dedication by artists and interns meant developed images and details to be enjoyed by pedestrians, highlighted by the detailed drawings of military and veteran logos on each column individually created by a high-school student for the motorists point of view.